Election stress drives some people to exercise, drink and worry. Some people (me) run to the kitchen. Jill Wendholt Silva of Knight Ridder Newspapers has an article with some suggestions for using your left over Halloween candy. Snickers, Junior Mints, Tootsie Rolls, Milky Ways, Bit-o-Honey, M&M's, and Dots can all be used in inventive ways. Hershey Kisses in Rice Krispy Treats, Bit-O-Honey Pumpkin Cake, Snickers chunks in a salad with apples chunks, Cool Whip, sour cream and peanuts? Woah! 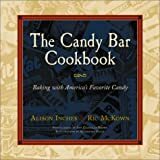 Alison Inches and pastry chef Ric McKown have written The Candy Bar Cookbook which might raise your BGL by just reading the recipes. Sounds like a great addition to a school library cookbook collection. This is a fun article with recipes included.